B U B B L E G A R M: Hit and miss..
FAIL: I hate Barry M's new instant (311) 'Nail Effects' which is basically a matte black nail polish that cracks once applied on top of another nail polish to reveal a unique design. Yes, the results are instant and it has an "effect" but it's not that great. On my short nails it just looks like chipped and peeled nail polish and I dislike that the results aren't consistent, sometimes it cracks nicely, and sometimes it bubbles up which leads to an uneven texture. Overall, this is a definite miss from me. SUCCESS: On the other hand I love Barry M's (244) 'Hologram' nail polish which is clear with chunks of small circular glitter that have a multi dimensional shine. It sounds tacky and childish but I really like it layered over the top of paler colours and grey to really make my nails sparkle. One coat delivers roughly 6 sparkles, I like to add 2 layers to really make them stand out. Also, I would like to add that the glitter is easily removed with nail polish remover. I just purchases the Barry M effect nail varnish yesterday and applied it to Dusty Mauve and it looked horrible. I have seen other bloggers applying it to bright colours like green etc and it looks really nice! The first Barry M polish looks literally like a hit nail (gross)...the second one is not my cup of tea, but definitely, much better than the other one! Yep...fail on the first one. Unless you are going for a Halloween look? Loved the second one. It reminds me of fairy cakes for some reason. I know some people really don't like Nail Effects but it looks like you've put quite a lot on the nail in this pic and I've found that it works best when you apply quite a thin layer. Maybe try it like that one more time to see if you ike the effect better? i love the hologram one! the effects?? meh...not feeling it either honestly. I also hate the cracked nail effect. I think ladies just get excited about anything new in the beauty world lol. It looks awful! The glitter on the other hand looks sweet and subtle. I also like that it's easy to remove! i've seen alot of reviews on this polish and I have heard that OPI are bringing out an 'effects' nail polish too, i can't remember from which collection because I've seen alot of pre release material on OPI collections so maybe the OPI one would be better. when I was in highschool i had a really good nail polish set, you applied the first coat of one colour and then the second coat of a crackle colour and it looked way better than this, i'll rack my brain to remember the brand and then i'll let you know. also, i'm not a big fan of chunky glitter nail polishes, so they are both a miss for me, unfortunately. @TzeYien89 I should hope so, but if it's a cracking concept then I will not be insterested. I have been looking out for the barry m black polish but it`s sold out in my local superdrug. I think you have put me off trying it - the pics look awful. I couldn't get hold of the special effects polish despite hours of searching around town...so whilst I'm sorry you didn't get on well with it I do feel much better to hear your review!! oh that nail effect is a serious miss! I have short nails too - and I know the feeling of how things have to be really consistent, otherwise they just look horrible! im on the same page as you! I'm not taken by the nail effects polish. I've seen it and passed it by. My polish chips enough all on it's own! The Hologram looks great though. I'll keep an eye out for it. I'm so glad you reviewed this!! 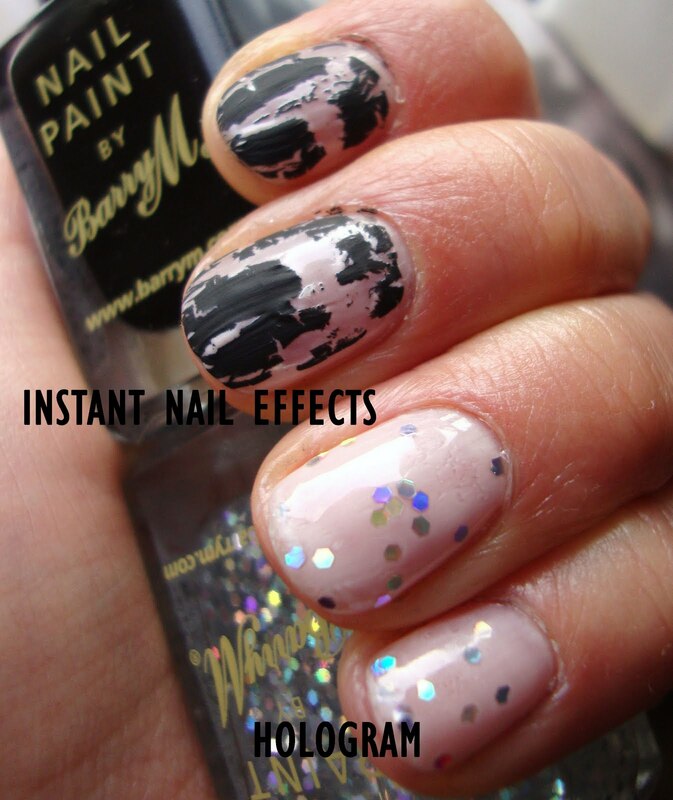 I wanted to try it and now I wont buy it.. shame on you Barry M!! I 'd love to try both of these!!! Barry M seems to have stepped up their game lately, at least it would seem so to me! i have to agree with you--i don't like the crackle effect..it definitely looks like a chipped manicure. i've noticed a lot of people are into that look lately, but to me it just looks messy. I dont like the Barry M effect nail varnish, think it is deffinatley a miss!